A while back we went over to my uncle's house for dinner and they made this amazing meal. Seriously knocked my socks off. This sauce was so killer. Then I went home and thought about making it for weeks but I just didn't have time to do it. And when I did it was wonderful. When I made it I used chicken because that was what I had on hand and it was seriously good. So it's great with pork or chicken. By my uncle's recommendation I doubled the sauce using half for the marinade and then following the recipe directions to cook it. I love recipes that are fast, simple, and seriously delicious and this totally fit the bill. I'm sorry that I have been so inconsistent with posting lately. It truly is amazing how life can quickly get in the way. These last few weeks have been full of crazy ups and downs. A week and a half ago I came down with the flu and ended up in the ER with extreme dehydration. I won't gross you out with the details of what sent me there or while I was at the ER but after 7 hours in the ER I finally started to feel human again. Unfortunately for my poor husband, we got home at 2:30 in the morning to find our daughter was sick and starting to head down the same awful path as me. So he packed her up and took her to the ER before she ended up in extreme dehydration state. The poor guy got home at 7:30 AM after being awake for over 24 hours and spending half of that in the ER. We've also had a surprise trip to Arizona to pick up a car from my in-laws, our turn to host our preschool coop, an unexpected death in the family, and a couple Thirty-one parties. Whew! I wish that February was looking a little less packed but there's no such luck. Anyways, on to the post. I was freaking out trying to figure out what to give the men in my life for Christmas. Guys can be so hard to give gifts to especially something homemade. All the men in my life love food and after a quick poll from friends on Facebook the consensus was something food related. 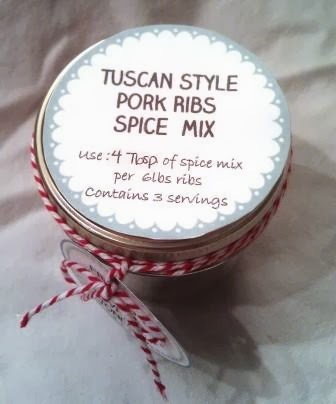 So I came up with the mason jar spice mix for one of our favorite recipes Tuscan Style Pork Ribs. Hopefully this idea might be something you could use for Valentine's Day or Father's Day. Here's the recipe with some free printables. 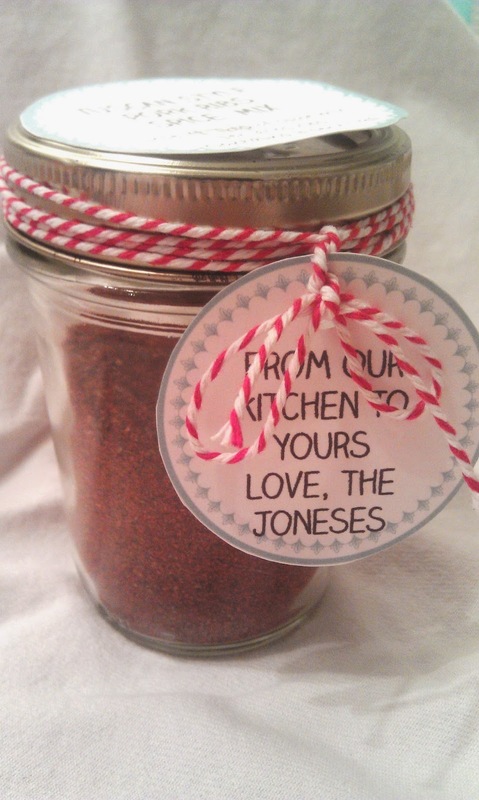 I got the adorable mason jar printable template from Today's Mama and used the Claire Hand font. That font is my current favorite. Super cute! I've posted before about my family's love of all things sourdough. 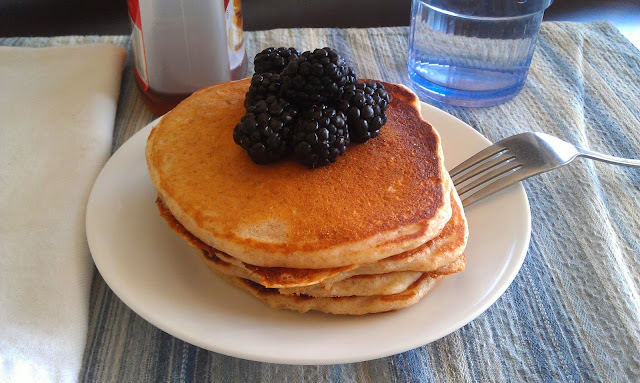 If your family is like mine then they should love these sourdough pancakes. They are another great use for when you feed your sourdough starter and don't know what to do with the starter you remove. I love having variety and now we have the trifecta of waffles, English muffins, and pancakes. The sponge is best made the night before but can be made the morning of if needed. Combine whole wheat flour, white flour, starter, and buttermilk in a medium sized bowl, stir until blended. Cover with plastic wrap and let stand at room temperature for 45 minutes or refrigerate overnight (again I recommend refrigerating overnight). Combine eggs, milk, and canola oil in a large bowl. Add buttermilk mixture and stir until blended. Stir in sugar, baking soda, and salt. Pet stand 5 minutes. Drop batter by 1/4 cup onto a hot griddle, greased of desired. Cook until tops are bubbly and beginning to dry. Flip and cook until other side is also browned. My favorite is topping is a warm fruit compote or fruit syrup.